Depending on the recipe, most baked goods require the use of eggs. Believe it or not, eggs serve a crucial role in many recipes, but cooking the perfect egg often proves to be a difficult task. This one simple ingredients has a series of characteristics, which can very depending on the method used to cook the eggs. Age of the eggs: There is a specific bonding between the inner membrane of the eggs and the egg whites. This bond can be specifically be seen in fresh eggs from a farm, which is why they are often difficult to boil/cook. These type of eggs can be best used for frying. On the other hand, this bond eventually breaks down overtime, making it easier to boil/cook eggs found at a supermarket. Protein Bonding Temperature: Egg whites contain certain proteins, that can bond together. These bonds affect the appearance and structure of the egg, as these bonds can lead to the rubbery texture of the egg white that can sometimes be found in hard-boiled eggs. Between 30-140°F, the proteins of the egg whites expand. Above 140°F, the proteins will bond and after 155°F, the proteins will solidify. At around 180°F, the proteins will bond together, giving the opaque and firm characteristics of the egg white. Any temperature above 180°F may lead to the release of hydrogen sulfide, which is responsible for the smell of rotten eggs, as well as the dark green-grayish compound located between the egg white and yolk if overcooked. Egg Yolk Temperature: The egg yolk is mainly composed of fatty acids, cholesterol, and some proteins. Because of this, different temperatures affects its performance. An egg cooked at any temperature below 145°F will have no affect on the yolk. Once reaching a temperature around 160°F, the yolk will become firm but it will still retain its bright color. Any temperature over 170°F will cause the yolk to turn a pale yellow, and it will have a crumbly consistency. This will result in its chalky texture and it will also release ferrous sulfide, which is also responsible for the smell of rotten eggs. Altitude: Altitude also plays a key role in cooking an egg as altitude affects the boiling temperature of water. According to the U.S Department of Agriculture (USDA), the boiling temperature at a point above 2,000 feet is around 208°F, lower than the ground level boiling temperature of 212°F. Due to this difference, it will take more time to properly cook an egg at higher levels than that of lower levels. On the other hand, there are also many ways to prepare eggs, with each method having its own scientific background to it. Heating: When heating eggs, the egg-white proteins move around and collide with water molecules. Due to this, weak bonds may break, causing the egg white proteins to uncurl and collide with other proteins that have uncurled as well. This results in new chemical bonds, connecting different proteins to one another. The breaking of bonds and formation of new bonds allow for the egg white proteins to form a series of interconnected proteins. These bonds are responsible for the ability of the egg whites to develop a rubbery texture, which was previously discussed in the “Protein Bonding Temperature” paragraph located earlier in this post. Beating/whipping: Beating or whipping eggs exposes air bubbles to egg whites. This exposure allows the unfolding of the egg proteins just as heating would unfold these proteins. Egg-white proteins consist of both hydrophilic and hydrophobic amino acids. In other words, some amino acids are attracted to water, while others are repelled by it. Prior to uncurling, the hydrophobic amino acids are located in the center away from the water, while the hydrophilic amino acids are located closer to the water. When the egg-white protein encounters an air bubble, part of the protein is exposed to both air and water. This causes the protein to uncurl so the hydrophilic and hydrophobic amino acids can be located in its desired respected area. This allows the amino acids to bond with each other, creating a series of bonds that hold the air bubbles in space. When heating the air bubbles, the gas inside them expands. Often, the area around the bubble solidifies, and the structure usually does not collapse when the bubbles burst. The protein that lines the outside of the air bubbles is known as lecithin. This is what prevents them from collapsing when baking. This allows for the consistency found in a soufflé or meringue. The more whipped the egg whites are, the more stiff they will become. On the other hand, unbeaten egg whites often allow the lecithin as a binder, which hold the cake together. Here’s an interesting fun fact: There is a myth stating that copper bowls are better for whipping eggs. There is some actual scientific support to this myth, proving that it is true. The copper ions from the bowl combine with conalbumin, one of the proteins found in eggs. This combination forms a bond that is stronger than the protein itself, making it less likely for the egg-white proteins to unfold. The copper could also react with sulfur-containing groups on other proteins found in eggs, making the egg proteins even more stable. If a copper bowl is not used, ingredients such as cream of tartar or vinegar can be used to produce a similar effect. Mixing: Many recipes call for the mixing of oil-based and water-based liquids. However, these two are immiscible and do not interact with one another. Because of this, egg yolks are often used to create an emulsion. Egg yolks contain a number of emulsifiers, with some of them being hydrophobic and others being hydrophilic. Because of this, thoroughly mixing egg proteins with oil and water will allow part of the protein to attract the water and another part to attract the oil. Just like egg-whites, egg yolks contain lecithin. The lecithin, which is a phospholipid, also acts as an emulsifier. Due to its structure (see figure below), it has a hydrophilic head and a hydrophobic tail. The tail gets attracted to the oil, while the head gets attracted to the water. These important characteristics of egg proteins play a crucial role in making foods such as mayonnaise, which require the mixing of water and oil. On a side note, eggs can also be used as moisteners (instead of using water) and a good source of fat and amino acids. It can also be used as a glaze as a source of protein for the Maillard Reaction. So next time you bake, don’t forget to note the complex structure and characteristics of an egg…it is because of this that eggs are used in various methods of cooking. Not only does an egg serve for taste, but it also plays a vital role in the texture or appearance of certain kinds of food. Baking a cookie is pretty simple. You can either buy pre-made cookie dough and just place little balls of the dough in the oven, or you can make cookie dough from scratch then bake it. However, did you ever look at baking a cookie through a chemistry aspect? Believe it or not, a series of chemical reactions takes place while baking a cookie! 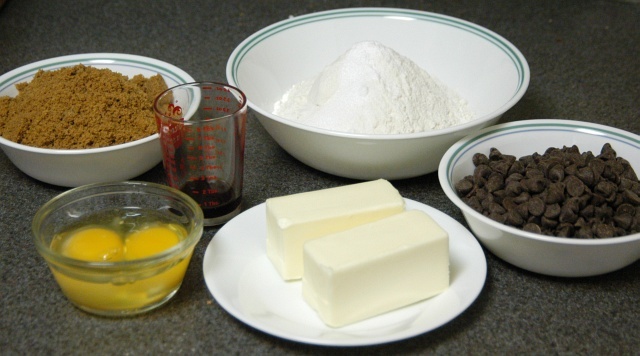 Here is a recipe for chocolate chip cookies, in terms of both “English” and chemistry. 1. Preheat oven to 375 degrees. Mix sugar, brown sugar, butter, vanilla and eggs in a large bowl. There is no chemical reaction that occurs while mixing these ingredients. There are only physical changes, no chemical changes. 2. Stir in flour, baking soda, and salt. As stated in the previous post, flour forms gluten. Gluten makes the mixture more elastic, so the flour is added later in the process to keep these gluten complexes small. This is why the dough is able to break apart. If it were to be elastic, then it would just end in a messy, goo-ey mess, and it would harder to form smaller pieces from the dough. The baking soda serves as a leavening agent to soften the mixture. 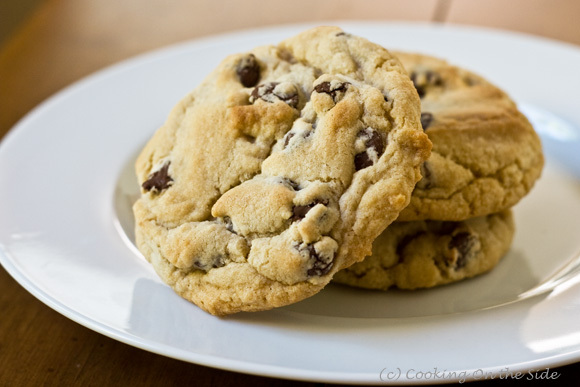 The chocolate chips do not have a significance in terms of a chemical reaction; they simply serve as an ingredient to add flavor to the cookie. 4. Drop dough by rounded tablespoonfuls 2 inches apart onto ungreased cookie sheet. The size of the dough is not just important in terms of preference. The size of the dough determines the results of the cookie. Carbon dioxide (CO2) bubbles form throughout the entire cookie, but only the outer edge of the cookies caramelize. 5. Bake 8 to 10 minutes or until the cookies become light brown. While baking, the heat allows for the sucrose (sugar) to break down into glucose and fructose. This causes a polymer chain which allows for the cookie to have a light brown, shiny crust. When the sodium bicarbonate (baking soda) absorbs heat, a chemical reaction occurs – 2NaHCO3 –> Na2CO3 + H2O + CO2. The carbon dioxide from the reaction can be seen from the bubbles in the cookies. The NaCl (salt) slows down the production of the carbon dioxide and prevents these bubbles from becoming big. The fat (butter) controls the formation of gluten from the flour, which contributes to its lighter texture. It also serves a role in the taste of the cookie. The emulsifier, or fat and protein from the egg yolk hold the dough together (the main purpose of an emulsifier), while the albumin from the egg whites support the bubbles. 6. The centers will be soft. Let cool completely then remove from cookie sheet. 7. Remove from cookie sheet and place on wire rack or on a table to finish cooling. The cooling allows for the completion of the caramelization process (this gives it the brown-ish color), and it also allows for the structure developed by both the gluten and the egg to set. * This recipe was reworded and taken from this website. Information was also taken from our previous posts. This year marks the 100 year anniversary of the discovery of the Maillard Reaction – a key reaction in food science. Several hundred scientists met in the small French city of Nancy to attend a conference that was held to celebrate the anniversary of this great discovery. The scientists gathered together to present scientific papers related to this chemical reaction. So, how did this reaction come about? It began 1912, when Louis-Camille Maillard conducted experiments based on the reasoning behind the production of carbon dioxide and change of color of raw ingredients when heated. He believed this reasoning would pave a new path for the world of medicine and diabetes, and did not bother to consider the importance of this discovery for food. Obviously, he was wrong, as his discovery proved to be a major milestone for food chemistry. The Maillard Reaction takes place in many cooking processes, and it is possibly the most favored and flavored chemical reaction. Now, you may be wondering…what exactly is the Maillard Reaction and why is it so important? The Maillard Reaction is actually a series of many complex reactions between reducing sugars (carbohydrates) and an amino acid (the basic foundation of all proteins). The Maillard Reaction is responsible for the browning of toast, nuts, hash browns, beer, roasted meat, etc. The glazing of milk and egg ingredients on baked goods lead to the Maillard reaction on the crusts of the baked goods, allowing for a browning on the surfaces. 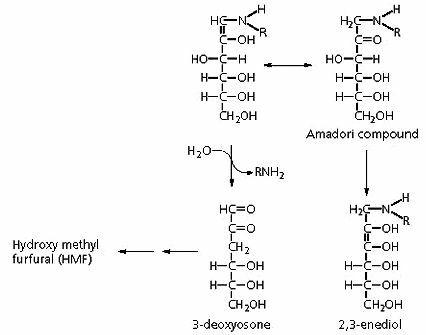 Step 1: A reducing sugar (such as glucose) reacts with an amino acid to form a product called the Amadori compound. The size of the reducing sugar affects the rate of reaction. Larger reducing sugars generally conduct a slower reaction and a lighter resulting color, while smaller reducing sugars generate an opposite affect. In addition, there are certain types of reducing sugars (such as sugar alcohols or polyols) that do not take place in the Maillard reaction. In other words, baked goods using these products will not be affected in a change of color. Step 2: Depending on the isomer of the Amadori compound, the amino acid can either be completely removed, or the isomer can be rearranged. This rearrangement is the main contributing factor towards the browning or change of color of the food during the reaction. The three different pathways usually end in the ultimate result of mixtures, which include flavour compounds and the brown pigments, melanoidins – the pigments often found in brown-colored foods. Table 1 displays the effects of these conditions on the Maillard Reaction. These contributing factors make the already-complex Maillard Reaction even more complicated, as a small difference can affect the taste, aroma, and color of the product. These factors along with the reaction can also form acrylamide and furans, dangerous substances that could potentially cause cancer. Therefore, it is important to note the amino acids and contributing factors when using cooking methods involving the Maillard Reaction, as a small alteration can yield a completely different product. Who knew a daily activity could contain a lot of chemistry with such complicated explanations? The video above demonstrates the Maillard Reaction, while discussing caramelization – another type of nonenzymatic browning reaction. This completely different process may be discussed later. Categories: ERB | Tags: amino acids, color, food chemistry reactions, heat, sugar | Permalink. How Does High Altitude Affect Baking?